This is my third post on summer cooking. See also Cool Summer Cooking Tips and Healthy and Tasty Summer Salads. Fruit soups. Kate provided a simple no-cook strawberry and pear soup (recipe below) Fruit soup is similar to a compote, and is easy to cook up in the microwave. Gazpacho. This uncooked soup, which can also be made from leftover salad, usually calls for canned tomato juice. I like this Spanish Gazpacho by Liz Steinberg, because fresh tomatoes are among the few ingredients. Bonus: How to Use Up Leftover Gazpacho. 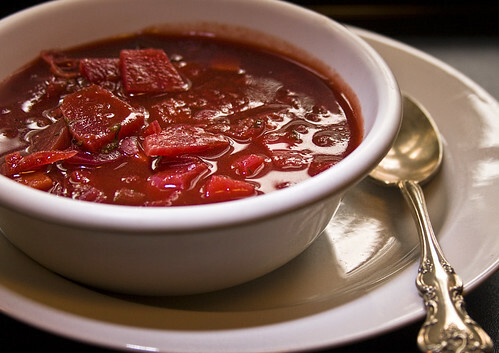 Summer Beet Borsht or Beet Soup with Ginger and Cumin are classically served cold. Vichyssoise is also normally served cold, and made with potatoes and leeks. Here’s a recipe from All Recipes, Classic Vichyssoise. If you follow a kosher or vegetarian diet you’ll want to substitute vegetable broth. But you know what? Vegetables can be the base of an excellent cold soup. Paula offers Gingered Red Pepper and Tomato Soup. Zucchini or winter squash soups, like Pumpkin Soup with White Wine and Rosemary, would also taste good cold. Using an immersion or regular blender, puree strawberries with water, diced pears, and apple juice. Add lemon juice and sugar to taste; how much sugar is necessary will depend on the berries themselves. I’ll bet some of your favorite hot soups will taste just as good cold, especially with some yogurt or herb garnish. Experiment, because you never know until you try. What cold soups can you recommend? Please share links or recipes in the comments. Lots of very inspiring recipes, thanks! We make carrot soup cold. Saute 1 onion a few cloves of garlic, 6-8 carrots cut into rounds till soft. Add water and spices (I add basil, and thyme or cumin, cinnamon, nutmeg, ginger salt pepper) boil till very soft and puree. I serve cold and if we have a milchig meal, people swirl in cream. That sounds easy and refreshing, Yael.